Chicken Tinga (Tinga de pollo) with Salsa Roja with Dried Chilies (Salsa roja de chiles secos). Where I live, in the Niagara region of Ontario, Mexican and Caribbean seasonal agricultural workers are not only essential to our farming industry, but also influence the area’s culinary landscape. When my Indian family first moved here, cilantro grew in our backyard near the strawberries because we couldn’t buy the herb locally. While general groceries now offer a broader range of items, sometimes the best shopping is to be had in the Latin markets dotting the area – their existence owed to those migrant populations. In these shops there’s cilantro, and not one style of fresh corn tortilla but four or five, varying in thickness and use, beside multiple brands of hot sauce and hominy. In one store I particularly enjoy, the Spanish soundtrack usually plays from a television that’s out of sight. I know there I can always find the passion fruit pulp I use for kulfi, and cotija and crema, which our grocery stores don’t carry. Just as those stores offer a glimpse into Mexican home cooking, chef Enrique Olvera similarly turns his attention to the domestic in his fourth book, Tu Casa Mi Casa: Mexican Recipes for the Home Cook. Olvera is at the forefront of Mexican cuisine, both in his native country and abroad. Known for his attention to refined detail, his flagship restaurant Pujol opened in 2000 in Mexico City, then 17 years later was reimagined in a new location with an even clearer vision. Tradition and modernity are juxtaposed; the welcoming clay comals (griddles to cook tortillas) and hearth against soaring, unadorned walls and textured tables atop gleaming granite floors. His famed Mole Madre remains, the product of 1,500 days of evolution, presented in an inky-brown-black puddle punctuated at its centre with a brick round of Mole Nuevo, in concentric contrast. The dish is emblematic of Olvera, complex but minimalist, all at once. That spirit is evident on the pages of Tu Casa Mi Casa. Pistachio Green Mole (Mole Verde de Pisatche) glows in its bowl. A verdant slurry of pistachio, poblano, tomatillos and greens, it is served beneath a heap of herbs and singed summer squash. The Corn Pancakes (Hotcakes de Elote), are a concise ode to the product; the batter has kernels with condensed milk, flour, butter and eggs, blended smooth. The cakes are topped with more corn, this time poached in agave syrup, with kernels added in stages so that some are almost candied while others have only just lost their raw edge. 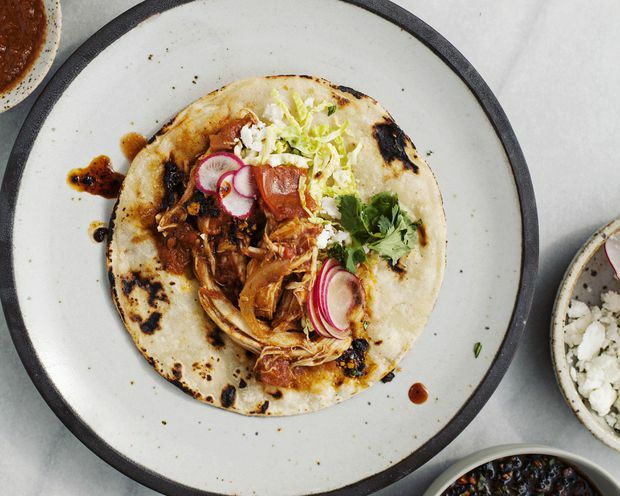 Chicken Tinga (Tinga de Pollo), a classic of everyday Mexican cooking feels particularly right to share. It’s a loosely sauced, sienna-hued braise, unwaveringly smoky with chipotles and deeply savoury, served over rice and with fresh tortillas. For all its flavour, it is remarkably easy to make. The headnote for the tinga suggests to cook it longer, thus thickening the sauce, and serving the stew over a tostada (a crisped tortilla). This was the route I followed with leftovers, with shredded cabbage, queso fresco, crema, and Red Salsa with Dried Chilies (Salsa Roja de Chiles Secos). I had some Peanut Salsa (Salsa Con Cachuate) – Olvera’s brighter take on salsa macha – kicking around from another day. The oil is a heady, ruddy mix of dried chilies fried and then ground, with roasted peanuts and confit garlic, then lime and cilantro at the finish. On the table there was also the book’s guacamole with herbs (Guacamole Con Hierbas), providing a direct infusion of green in these last days of winter. Roughly mashed avocado, lime, salt, and tender leaves, flecked by thinly sliced serrano bringing vegetal heat. Fresh and bright, and the ideal balance to the smoky salsas and supple braise. Tu Casa Mi Casa offers home cooking with the eye of a restaurant chef; clear, straightforward instruction with lessons peppered throughout – the type of talk one expects while working at the counter with an experienced cook, or overheard in the aisles of a local market. In a medium pot, combine the chicken, onion halves, whole garlic cloves, and 1 tablespoons of the salt. Add water to cover and bring to simmer over medium-high heat. Simmer, uncovered, until the chicken is cooked through, 30 to 40 minutes, skimming occasionally to remove impurities. Remove the chicken from the broth and let rest until it is cool enough to handle. Using your hands, pull or shred the chicken and reserve. Strain and reserve the broth as well. In a medium to large pot, heat the oil over medium heat. Add the sliced onion and garlic and cook until translucent, about 5 minutes. Add the reserved shredded chicken, the chipotle chilies, tomatoes and 1 cup of the chicken broth (reserve the rest for other preparations). Cook until the tomato breaks down and changes to a brick colour, 5 to 10 minutes. Season to taste with salt. Add some more cooking broth if necessary; it should be a bit soupy. Serve hot or let cool and refrigerate for up to 1 week or freeze up to 1 month in an airtight container. In a medium pot, combine 2 tablespoons oil, the garlic and onion and cook over medium heat until soft and translucent, about 3 minutes. Add the tomatoes and chilies and cook until soft, about 10 minutes. Add the salt and remove from the heat. Transfer to a blender and blend until smooth. In a medium pot, heat the remaining 2 tablespoons oil over medium-high heat. Add the mixture and fry until it changes colour to a garnet orange, 5 to 10 minutes. Serve warm or at room temperature, or store in an airtight container in the refrigerator for up to 1 week; or freeze up to 1 month. Recipes adapted from Tu Casa Mi Casa by Enrique Olvera (Phaidon). Reprinted with permission.